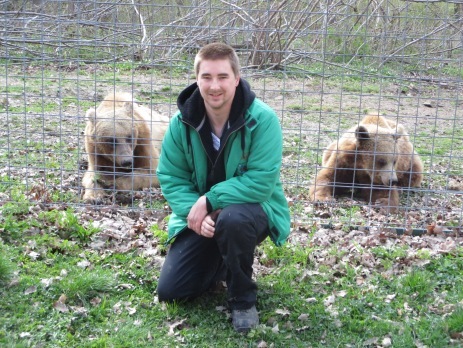 A huge thank you to Luke for sharing his experience of volunteering in Romania with us. Why does time always fly by when you’re having so much fun? I’ve just spent three weeks with the Bear project in Romania and it feels like it all went by in the blink of an eye, it’s not fair! 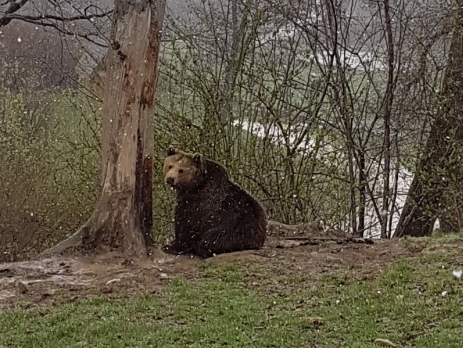 Getting to see the bears everyday and stroll around Brasov in the evening was a true pleasure. Sitting back home watching day time TV I wish I could jump on a plane and go back. Our day started at 8.15am with a forty minute car ride to the sanctuary, I have to give a special mention to our driver Mariane who was always on time and provided us with a lot of info on the local area. After a fifteen minute hike up through the sanctuary it was onto food prep (I’d highly recommend taking your time to watch the bears and take some nice pictures during this time). My time at the sanctuary was spent exclusively on food prep. Whilst I would have liked to have gotten involved in more tasks, on reflection I can see that the bears come first and if the bears need food we have to feed them. There were so many highlights that it’s hard to narrow them down. 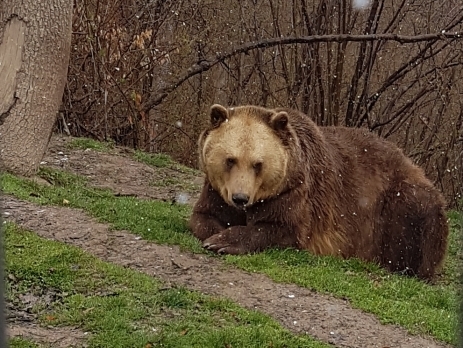 However, the two that stand out are getting to watch the bears during feeding time and witnessing the cubs get moved into their new enclosure. I’m afraid I lack the skill to describe the effect that witnessing up to twenty bears at a time come strolling out of the forest looking for their breakfast has. It’s a sight that any animal lover needs to see for themselves. Also, whilst we were there Bim and Bam (the cubs) were moved into a new enclosure and Florian (the sanctuary manager) was kind enough to show us a video of the bears being released into their new home. We also had a good laugh watching one of the fattest dogs I have ever seen chase rats around the food prep area and on my last day the two goats escaped from their enclosure and decided to rampage around the food prep area. No harm was done by the goats and they were quickly rounded up by one of the sanctuary dogs. My advice to future volunteers would be, work hard but also take time to enjoy the sanctuary. Watching bears playing is a pretty good way to spend a coffee break after all. Due to the nature of working at a sanctuary plans can change at short notice. On a couple of occasions, we had a tour, trip to the viewing platform or a chance to watch the bears getting fed planned and they had to be cancelled at short notice. For my borderline OCD brain this was a bit hard to adjust to but all of the above did happen and the bears come first at the end of the day. I think as long as you remain flexible, work hard, use common sense and respect the sanctuary you’ll have a blast like I did. Life at the apartment was comfortable if a little cramped. We got a pretty good dance going at one point when a few of us tried to cook at the same time. However, the apartment is right in the middle of Brasov so your never more than a five minute walk away from a nice bar or restaurant. There’s always good old Dominoes to fall back on. Our free time included trips to Dracula’s castle, Peles Castle, seven ladders canyon, adventure park, water park, cinema and shopping mall. There’s plenty to do and our rep Razvan was really helpful when it came to arranging trips, offering advice and was only a phone call away in case of a problem. Having Razvan there with us made me feel a lot more at ease in Brasov than I would have done if I was solo traveling and his local knowledge was a real help. I had a blast in Romania and working at the sanctuary was an experience that I’ll never forget. Can’t wait for my next adventure, I’ve only been home for a few days and I’m already bored! If you would like to get involved in the programme and head out to Romania, like Luke, then check out our website.